In On the Ruins of Chaos you lead one of four scheming factions on a great escape from the harvesting grounds near recently awoken Mount Vargah. While battling your opponents for survival, our army grows in power and resources. Will it be enough to reach sanctuary or will you suffer defeat at the hands of your pursuers? During the Great Flight old feuds are settled between the factions... The Arnunnian Alliance has mastered magic and strikes with lightning speed; the Red Barbarian Brotherhood pursues with brutal and unrelenting force; the Pirate Confederacy cunningly sneaks past their opponents, while the Undead Legion's growing numbers threaten to overwhelm all that stand in their way. X610Z: Existenz is a strategy card game in which epic battles are fought on a game board representing a dangerous post-apocalyptic world. 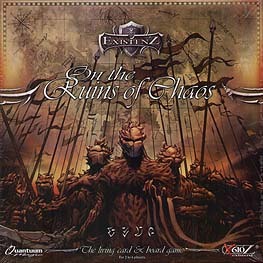 On the Ruins of Chaos comes with four powerful card decks, each with its own flavour and mechanics, and is suitable for up to 4 players in single game (1vs1), team game (2vs2) and multi game (up to 4 individual players).